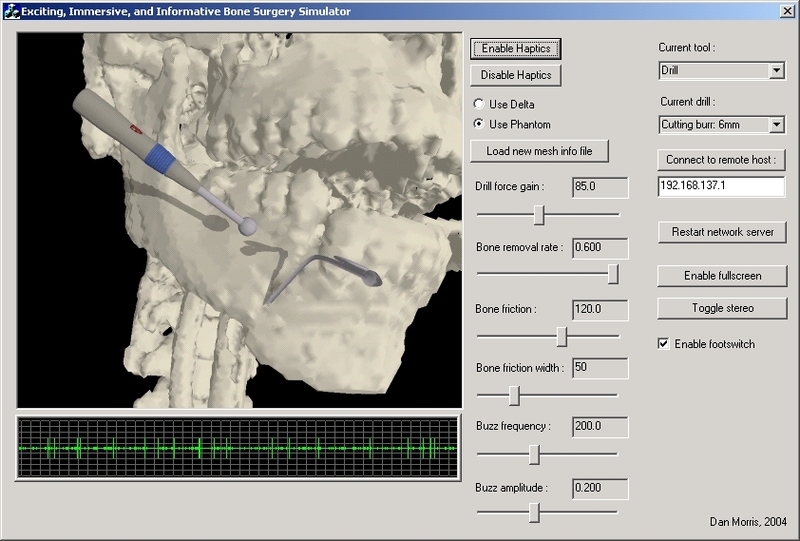 Morris D, Sewell C, Barbagli F, Blevins N, Girod S, Salisbury K. Visuohaptic Simulation of Bone Surgery for Training and Evaluation. IEEE Computer Graphics and Applications, November 2006. 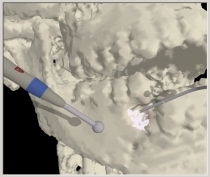 Morris D, Sewell C, Blevins N, Barbagli F, Salisbury K. A Collaborative Virtual Environment for the Simulation of Temporal Bone Surgery. Proceedings of MICCAI 2004 (LNCS 3216 and 3127). 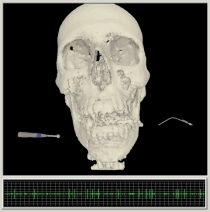 Morris D, Girod S, Barbagli F, Salisbury K. An Interactive Simulation Environment for Craniofacial Surgical Procedures. Proceedings of MMVR (Medicine Meets Virtual Reality) 2005. Sewell C, Morris D, Blevins N, Barbagli F, Salisbury K. Achieving Proper Exposure in Surgical Simulation. Proceedings of MMVR (Medicine Meets Virtual Reality) 2006. Sewell C, Morris D, Blevins N, Barbagli F, Salisbury K. Quantifying Risky Behavior in Surgical Simulation. Proceedings of MMVR (Medicine Meets Virtual Reality) 2005. 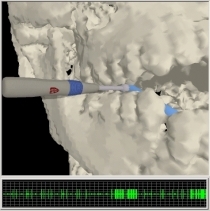 Sewell C, Morris D, Blevins N, Barbagli F, Salisbury K. An Event-Driven Framework for the Simulation of Complex Surgical Procedures. Proceedings of MICCAI 2004 (LNCS 3216 and 3217). Our simulation runs on a dual-CPU Windows PC, and was developed in C++. OpenGL is used for graphic rendering (optionally in stereo, via shutter glasses or a HMD), and two SensAble Phantom haptic devices are used for simulating a drill and a suction device. We typically use a Phantom 1.0 for the drill and a Phantom Omni for the suction device. Sound is rendered as a noisy sum of harmonics, whose frequencies are based on experimental recordings of surgical drill burrs. 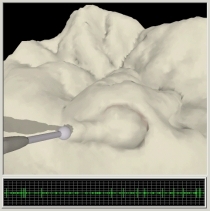 Several features, including sound and dynamic bone dust movement, are best demonstrated via video; each section below contains a link to a short movie. Most of the movies are encoded in mp4, either as QuickTime mp4 files or as avi files. If you have trouble playing them, I recommend downloading the 3ivx codec, a nice (free) mp4 codec package. 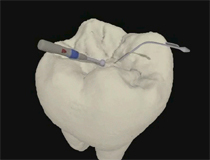 This video (wmv) is an overview of the system, showing several clinical applications simultaneously. This video (QuickTime mp4) demonstrates basic drilling on the surface of the skull, near a mandibular fracture. The user is making the first fracture typically introduced in a distraction osteogenesis procedure. 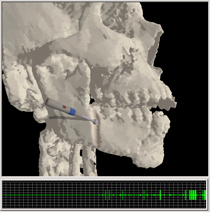 Note that as the tool approaches the alveolar nerve, the virtual nerve monitor provides a visual and auditory warning. 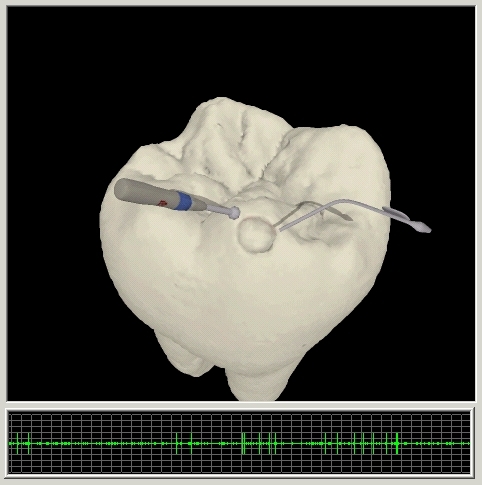 For demonstration, the user then exposes the nerve visually. This image displays a complete skull, originally derived from a CT scan. 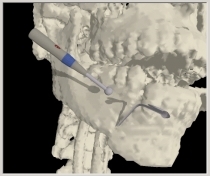 The CT data was isosurfaced to isolate the bone, then converted into the simulation environment's volumetric representation. Here the user prepares to begin drilling near a mandibular fracture. Shadows again provide a useful depth cue, although depth presentation is enhanced significantly by the optional stereo display. Here we represent a virtual nerve in blue, for visual clarity. Note the bursts of activity on the neural monitor, which result from close contact between the drill and the virtual nerve. The user begins to drill on the surface of the bone. Again, bone dust accumulates and obscures the user's view until suction is applied. This image demonstrates the complete GUI available in the training mode of our simulation. Note the ability to toggle among multiple drill head types and sizes, the ability to connect to a remote copy of the application to demonstrate drilling technique over the network (visually and haptically), and the variety of haptic parameters that can be modified. 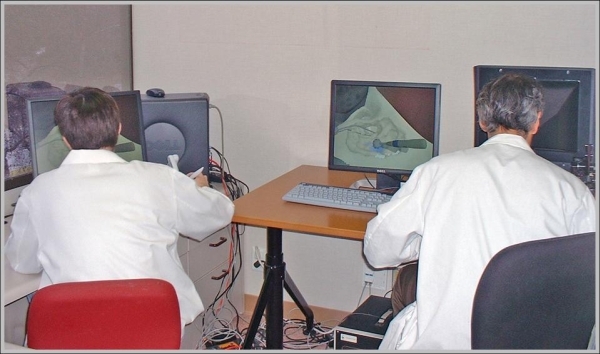 Normally these would not be modified during a training procedure, but we use these parameters as a way of allowing an experienced surgeon to tune the haptic feedback provided by our system. This video (QuickTime mp4) demonstrates basic drilling on the surface of a tooth, illustrating the flexibility of our environment in loading diverse data sets.